Puppy coughing is a rather common illness symptom, which can be caused by a number of health problems, such as worms, respiratory problems, bacterial and viral infections like kennel cough and puppy distemper. 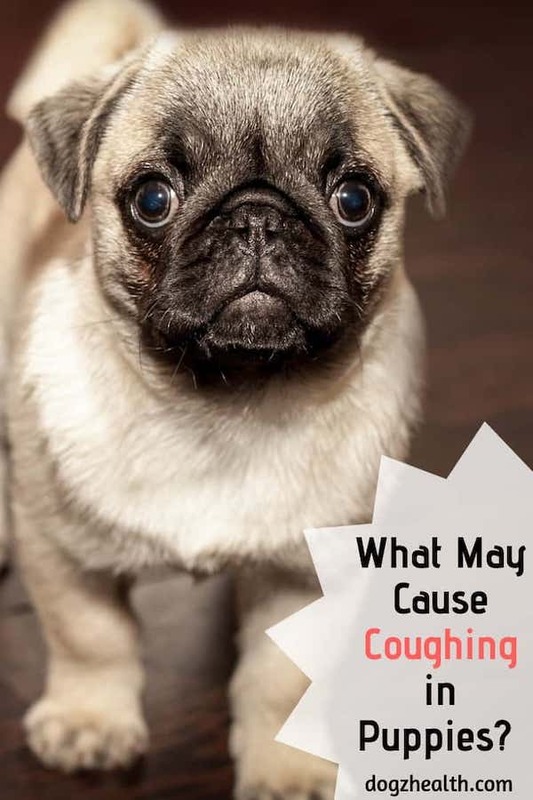 Read on and learn more about the common causes of coughing in puppies. A coughing puppy is a sick puppy, but some causes of coughing in dogs and puppies are more serious than others. It is useful for dog parents to learn more about the different possible causes that can lead to coughing in puppies. Also, there are different types of cough (e.g. a dry hacking cough, a “wet” productive cough, etc. ), and each type often indicates different health problems. By learning about the types of cough, we may be in a better position to understand the possible reason that is causing the cough. Visit our page on canine coughing to learn about the different types of cough. 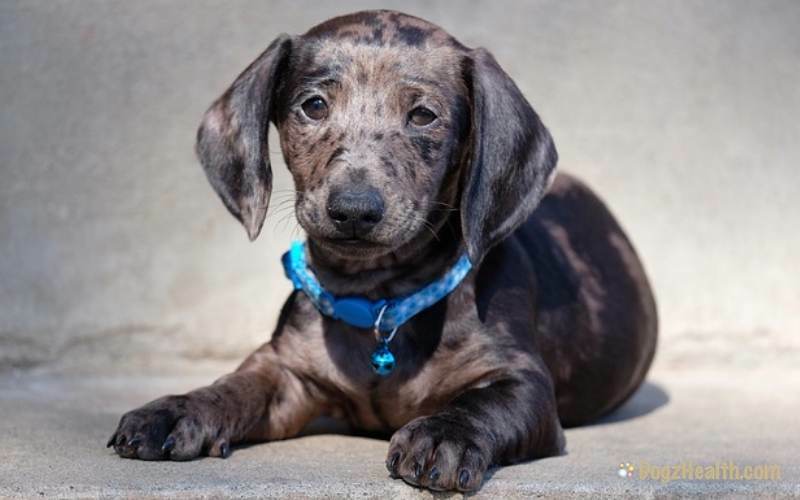 Roundworms and heartworms can cause coughing in puppies and dogs. In particular, roundworms are common in puppies. Roundworm larvae travel to the lungs in the bloodstream, crawl up the windpipe, and are swallowed to return to the intestine and mature into adults. As they travel up the windpipe, they cause bouts of coughing (dry to moderately moist). Heartworms can also cause a dry to moderately moist cough, which gets worse when the puppy is lying down. The coughing occurs when the immature heartworms migrate into the lungs. Kennel cough is another common cause of puppy coughing, especially in young puppies. The most common virus that causes kennel cough is canine parainfluenza virus. The most common bacteria is Bordetella bronchiseptica. The type of cough is an unproductive, harsh, dry, hacking cough, often with gagging and retching. You may also find a puppy with kennel cough having a watery nasal discharge and/or eye discharge. The puppy may also have nasal congestion. Pneumonia tends to affect very young puppies (and very old dogs). What causes pneumonia in puppies? Bacteria, viruses, fungi, or parasites are the main culprits. One classic symptom of canine pneumonia is a moist, bubbling cough, indicating fluid in the lungs. Besides coughing, the puppy will often have a fever, rapid breathing and pulse and depression. Puppy cough may also be caused by canine influenza, characterized by a soft gagging cough (as opposed to the goose-honk cough of kennel cough). The puppy will also have a high fever and a nasal discharge. Canine influenza can be fatal in young puppies (and old dogs), so if you suspect influenza in your pup, be sure to take him to the veterinarian for treatment. Puppies and dogs with allergies may develop a “moist cough”. It’s the body’s way to try to expel whatever inhaled irritants (e.g. pollen, cigarette smoke, etc.) that may have entered the respiratory tract. The coughing may stop once you remove the source of the allergen from the puppy. Also keep the house clean and free from dust, especially the area where the puppy is sleeping. Use a humidifier to help the puppy breathe more easily. Puppy septicemia refers to blood-borne infections in young puppies (5-12 weeks of age). These infections are caused by bacteria that gain entrance via the respiratory and gastrointestinal tracts. Puppies in overcrowded and unsanitary living quarters and/or with heavy parasitic infestations run a high risk of developing complications. Sometimes the result could be fatal. Signs of respiratory involvement include cough, fever, nasal discharge and noisy rapid breathing. Very rapid labored breathing or the breathing is hindered. Moist cough with mucus, blood or pus. Severe or prolonged coughing (e.g. each coughing spell lasts over a few minutes). As coughing is one of the body’s ways to try to get rid of foreign irritants and infectious bacteria from the respiratory tract, it should not be suppressed without finding out and treating the underlying cause. But there are ways to make your coughing puppy more comfortable, such as using OTC cough expectorants and other home remedies. 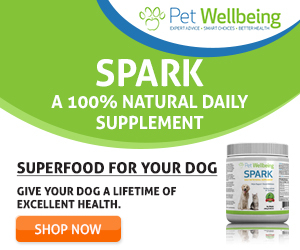 Please check our page on Cough Medicine for Dogs for suggestions.